After a bit of juggling with adjectives and word order, the Iraqi National Alliance (INA, in Arabic referred to as al-Ittilaf al-Watani al-Iraqi) was launched in Baghdad today, thereby becoming the first publicly confirmed major electoral alliance for next year’s parliamentary elections in Iraq. Essentially, the new coalition consists of the two largest blocs of the previous Shiite alliance (the United Iraqi Alliance or UIA) – the Islamic Supreme Council of Iraq (ISCI) and the Sadrists – plus elements from the wing of the most pro-Iranian of the two Daawa factions, known as the Tanzim al-Iraq branch, as well as Ibrahim al-Jaafari’s breakaway faction. The only significant components from outside the old UIA are the Anbar Salvation Council headed by Hamid al-Hayis (a breakaway group of the Anbar awakening which received only a modest share of the votes in the last local elections) and Khalid Abd al-Wahhab al-Mulla, the president of a Sunni group of Islamic scholars from Zubayr outside Basra. Additionally, the party of the Shiite Bahr al-Ulum family, which was sometimes separate from the old UIA, has been reintegrated. It may be useful to briefly recapitulate how the new alliance evolved. The idea of a “revived” Shiite alliance with a more “national” orientation was first introduced publicly by Muqtada al-Sadr in Qum, Iran, in mid-February 2009, when he requested a full makeover of the UIA which in the future should be referred to as the “United National Iraqi Alliance”. Sadr was responding to the results of the January local elections, in which the Daawa party of Prime Minister Nuri al-Maliki was rewarded by voters for a rhetoric in which the sectarian agenda was pushed in the background and the focus on national and centralist values was strengthened. After Sadr’s initiative, other forces in the old UIA, including the pro-Maliki independent Abbas al-Bayati as well as Ahmad al-Chalabi, soon offered their support, but it was not until May that the project got going in earnest. By that time, ISCI – which had been punished particularly hard by voters in the January polls – had taken over the initiative, and within weeks several dozen key UIA members paid their visits to ISCI’s ailing leader Abd al-Aziz al-Hakim at a convalescent home in Tehran where details of the new alliance were discussed. Reportedly, Muqtada al-Sadr also made the journey from Qum to reconcile with Hakim, a long-time opponent, apparently seeing the symbolic change of name as a “Sadrist demand” that could justify their return to the UIA. At one point, it seemed as if the new alliance was on course to co-opt Maliki and thereby could hope to reclaim lost voters. However, once more old disputes between Maliki and ISCI came to the fore in June and July. Far from preaching ecumenism towards ISCI, Maliki held on to his centralist discourse on several occasions, focusing on the limits of the power of the governorates at a time when ISCI along with the Kurds kept talking about unrestrained decentralisation. Similarly, at the recent general conference of the Daawa party, Maliki’s distaste for militias was emphasised (“we don’t have militias because we believe in the state”), another indication that he did not mind his differences with ISCI and the Sadrist remaining on display in the public domain. While Maliki talked about “no alliances for the sake of alliances”, ISCI seemed prepared to ignore ideological differences if only Maliki would join their new alliance (and thereby keep the Shiites unified at any cost – his disinclination to do this was ascribed to personal ambitions regarding the premiership and the Daawa share of seats in the new alliance). Last week, the entire process seemed to be in complete disarray: During the course of a single day, no less than four different dates for the forthcoming announcement of the alliance were cited by various UIA members; simultaneously, at the level of local government, Maliki supporters were allegedly expelled from the provincial council of Diyala by an ISCI-friendly coalition while ISCI partisans complained of their marginalisation by the Maliki-dominated council in Diwaniyya. However, not even the latest string of bomb attacks in Baghdad – no doubt designed to hurt Maliki’s vision of a normalised Iraq where concrete barriers could be safely removed, and even blamed on Iran by at least one senior intelligence official – seems to have changed his mind. As a consequence, the Maliki branch of the Daawa was the notable absentee at today’s announcement. A footnote on the perennial subject of Daawa subdivisions seems appropriate at this point. During the summer there have been several of them, mostly neglected by the international press. First, in late July Diyya Amin al-Sayyid Nur abruptly declared a complete change of leadership in Harakat al-Daawa, one of the smallest (and oldest) wings of the Daawa, with particularly close ties to Basra (the late Izz al-Din Salim was perhaps the most prominent representative of the party). A few days later, Muhammad Jasim Khudayr al-Maksusi, another party member, categorically rejected the move. Then, in early August, an apparent coup attempt took place within the Tanzim al-Iraq branch of the Daawa. 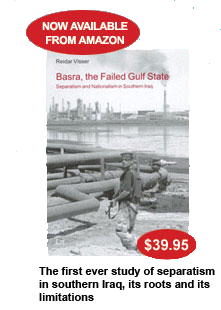 The party is of far more recent origin, and while it is often misinterpreted as some kind of “domestic Daawa” it seems clear that it was created by Iran shortly before 2003 in order to regain lost control within the Daawa movement, operating out of offices in Qum and London before it came to Baghdad after the American invasion. Earlier this month, whilst many leading parliamentarians were on summer holiday, Abd al-Karim al-Anizi arranged a party conference in Baghdad and elected a new leadership, to loud protest from other party members including the party chairman Hashim al-Musawi, but with the support of Isa al-Firayji, the head of the television channel al-Masar (which since has physically occupied the Tanzim al-Iraq website). Significantly, after this incident, Anizi has remained particularly central to the formation of the new INA. He is considered among the most pro-Iranian elements in Daawa (Tanzim al-Iraq) and is also known as a consolidator who has been emphasising sectarian solidarities with the Sadrists. His role in reconstituting the UIA was highlighted by ISCI preacher Jalal al-Din al-Saghir a few weeks ago, and today during the formal launch of the INA he was once more prominent, whereas many other Tanzim al-Iraq leaders were reportedly absent. The centrality of people like Anizi to the INA project is one among several factors that raise certain doubts about the sincerity of its new “national” agenda. Of course, some will ask how there could possibly be anything sectarian about a new alliance that actually leaves out some Shiites (Maliki) to the advantage of Sunnis (such as al-Hayis)? Similarly, at one point, the pro-Shiite newspaper Al-Bayyina al-Jadida claimed that the highly respected former minister Ali Allawi had joined the project, surely he could be a bridge-builder towards secularists? 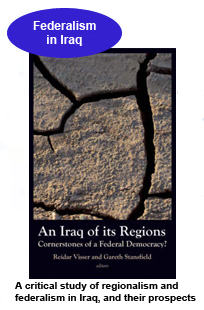 But while new constellations of this kind in themselves doubtless are of immense value to the maturation of the Iraqi political process, in this case, the basic facts of the genesis of the alliance simply speak a lot louder than rhetoric of national unity. Agreement on the new alliance seems to have been arrived at in Tehran, and it is basically a case of Shiite Islamists with long-standing Iranian sympathies like Abd al-Aziz al-Hakim and Abd al-Karim al-Anizi reaching an understanding with other Shiite Islamists whose turn to Iran is of far more recent date (and probably is still disputed by many of their adherents in Iraq), as in the case of Muqtada al-Sadr. Already in May, full lists of the new alliance circulated; they included the entire old UIA, with unspecified “independent” and “tribal” Sunnis forming a beautifying addendum ( “Look we are a national party, we are not excluding our brothers from Western Iraq ”). Last week, ISCI even let it be known publicly that there had been a visit to the Grand Ayatollah Ali al-Sistani in Najaf , the world’s most prominent Shiite leader, to “confer” about the new alliance. And while most elements of the new programme and “principles” of the alliance published today come across as rather bland, unobjectionable and therefore also unremarkable (fostering civil society, protecting the environment etc. ), one item will be difficult to stomach for those with more secular inclinations or non-Shiite backgrounds: the new alliance will “adhere to directions from the marjaiyya”, which could mean the higher Shiite clergy in its widest possible sense (even the usual restriction to “the marjaiyya of Najaf” or “the marjaiyya of Iraq” is omitted). In this context, Hayis and other elements from outside the old UIA run the risk of becoming figureheads and stooges for Shiite Islamist interests first and foremost. The invitation to other forces to “join” now looks somewhat tongue-in-cheek given that the party programme has already been decided, and seems mainly aimed at the possibility of Maliki joining at a later stage (the mention of the possibility of constitutional reform, the reference to the virtues of a “strong state” as well as the absence of the word “federalism” from the key party documents released today might all represent potential olive branches in this regard). As for the reasons for the sudden haste in declaring the alliance – with the apparent use of a deadline to put pressure on a Maliki – we can only speculate. But at least two factors stand out. Firstly, in Tehran, Abd al-Aziz al-Hakim’s health once more seems to be deteriorating, with reports that he has been transferred to a more intensive form of hospital care. Secondly, from Qum, there are rumours that Muqtada al-Sadr may be about to return to Iraq, possibly even with enhanced scholarly credentials. Both these factors might unleash destabilising forces within the Shiite community that Iran may wish to avoid. Struggles for power are already going on within ISCI and the Badr forces; they look set to intensify in the case of a succession crisis after Hakim. Similarly, Muqtada al-Sadr has been sheltered from Iraq for more than two years now and any sudden reunion between him and his supporters in Iraq would carry the potential for disagreements, destabilisation and fragmentation. To Iran, then, it may have seemed prudent to try to put in place some kind of integrative mechanism that could guarantee Shiite sectarian unity in the 2010 parliamentary elections. Ideally, this would have involved Maliki participation and some kind of public embrace by Sistani; from this point of view, the INA still looks very rudimentary and unsatisfactory. The attention will now shift to those forces that have yet to declare their alliances for the parliamentary eletions that are scheduled for 16 January 2010: Maliki as well as the various nationalist opposition parties. 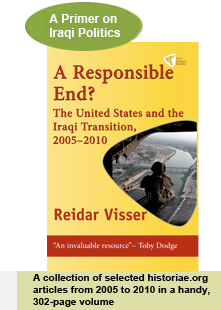 If Iraq is to make a meaningful transition to a less sectarian form of politics, it is important that the anticlimaxes of 2008 are not repeated. During the spring there was a lot of cross-sectarian cooperation in the Iraqi parliament, but while this resulted in victories like the provincial elections law, nothing durable came out of all the promises of a monster national alliance. Maliki, for his part, will also need to go beyond what he accomplished in the local elections, which was more of a shift in rhetoric than a real integration of new political forces outside the Shiite Islamist core. So far there has been talk about an alliance between Maliki and the awakening forces of Anbar. As for the nationalists, there are signs of growing cooperation between forces like Iraqiyya, the Constitutional Party of Jawad al-Bulani, Tariq al-Hashimi, Salih al-Mutlak, Nadim al-Jabiri (from Fadila, which early on rejected the UIA makeover as political theatre but which now is reported as a last-minute convert to the project) and Mahmud al-Mashhadani (the former speaker of parliament, associated with the 22 July movement) – a trend that seems particularly significant in that it could potentially reverse a tendency of Iraqiyya to sometimes support ISCI in parliament even in cases where this runs counter to its own declared ideological principles (in early August there was even a visit by an Iraqiyya delegation to Iran). If two such grand cross-sectarian coalitions should emerge then the next elections could indeed become a step forward for Iraq. And in that context, the INA in its unfinished state (and therefore in practice somewhat less sectarian than originally intended) could also play a constructive role.